* Who is in the market? - This is defined by volume and relative volume. More market participation means more institutional participation and greater volatility of price movement. * What are they doing? - Are market participants leaning to the buy or sell side? Is that leaning shifting over time? As we shall see, the distribution of stocks trading on upticks versus trading on downticks is helpful in reading participant behavior. * Where are they doing it? - We hear traders talk about "key levels" all the time. Sometimes these are based on support/resistance; sometimes based on ratios and inferences from prior moves. Whatever. When we see significant shifts in "who is in the market" and "what they are doing", the price levels at which these shifts occur are meaningful. If we break to the downside on significantly elevated volume and stocks trading on downticks, we should not revisit the level at which the break occurred if this is, indeed, the start of a market downleg. * How well are they getting it done? - How much price movement are we seeing as a function of a given level of buying or selling? Are buyers or sellers moving price meaningfully higher or lower, or are they having difficulty breaking to new highs or lows. Very often, before the bulls take over from the bears or vice versa, we see one side failing to move price significantly. That side becomes trapped when the other side takes over and needs to cover, contributing to a move in the other direction. 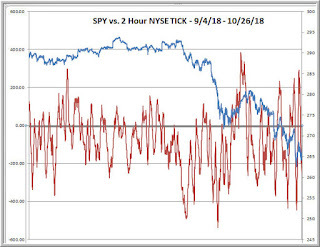 Above we see a chart of a two-hour moving average of the NYSE TICK (red line) versus SPY (blue line) from the start of September to present. Note how, during the run up to highs in September, the distribution of NYSE TICK values was not meaningfully positive. The amount of time spent below the zero line was as great as the amount spent above--and actually a bit greater as we moved closer to the highs. This was one of the yellow caution lights that had me concerned about the quality of the market highs we were seeing. Notice how, at the start of the downtrend, we broke to significant new lows in the $TICK measure. That shift in distribution told us that sellers had taken control of the market. Note that this occurred relatively early in the decline, when SPY was about 289. Stocks persistently traded on downticks. In recent sessions, we have seen buyers come into the market, as we can see by the two-hour measure going into positive territory, but note that they are not "getting it done". The buying bursts, mostly short-covering, are able to retrace only a relatively modest fraction of the prior price decline. At some point--and I'm prepared for it to come soon--the selling pressure will have trouble making new lows and buyers will step in more aggressively, with higher $TICK readings. That is how bottoming processes begin. 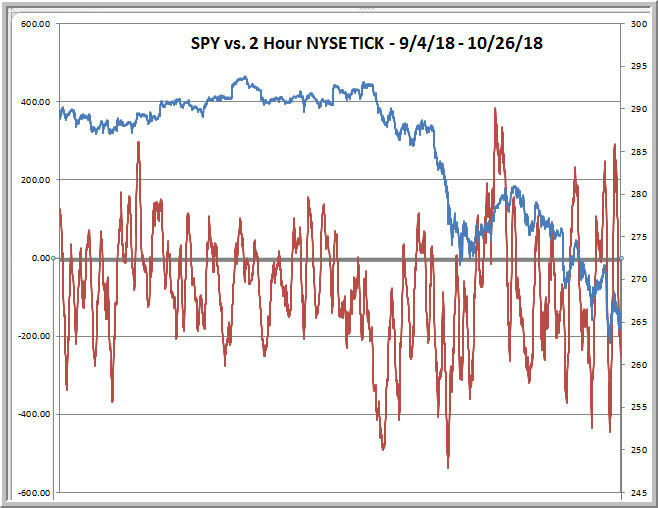 Conversely, if we start the week lower on expanded volume and very negative $TICK readings, then we know we have not yet hit a downside equilibrium. We can read market psychology by continually updating our assessment of volume, distribution of upticks and downticks, and the ability of both of those to move price. This is not so much a matter of "predicting" what the market will do as identifying in real time what is actually occurring. I have been pleasantly surprised by the initial interest traders have expressed in the book I am writing on spirituality and trading. The key idea is that many trading problems spring from our failure to transcend the ego. We identify with winning/losing, with overall P/L numbers, with being right or wrong in our ideas, and all of these identifications lead us to overreact to markets. The world's great spiritual disciplines are tool kits for moving beyond our egos by connecting with larger realities. The purpose of the book I'm writing is to acquaint traders with these tool kits and their potential for improving not only trading, but all of life. One spiritual perspective is that all of our problems recur until we learn from them. 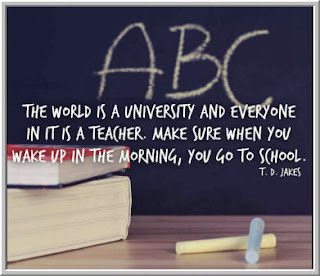 Life is a classroom and the problems we face repeatedly are the lessons we're meant to learn. What are your trading problems, and what are they trying to teach you? Your problems are your curriculum. Only when we embrace our problems do we learn from them and become more than we are. Let's take a look at how the state of our bodies impacts our health and well-being and ultimately the mindsets we bring to trading. * Recent research suggests that a sedentary lifestyle--one without exercise--is more harmful to our health than smoking, diabetes, or high blood pressure. The lack of aerobic fitness is a larger risk factor for mortality than having many medical conditions that we regard as necessary to treat. * Poor posture, such as sitting hunched over a screen for many hours per day, has been implicated in low blood oxygen levels. Low blood oxygen levels are associated with higher stress levels and greater fatigue, both of which can negatively impact our executive brain functions and ultimately our performance. * Fascinating studies placing people in high altitudes (and thereby reducing their blood oxygen levels) find that low blood oxygen is responsible for declines in mood and worse cognitive performance. 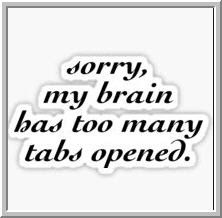 Poor aerobic fitness interferes with our optimal processing of information. * Research finds that increased exercise is associated with lower rates of depression and greater levels of happiness. Exercise also improves our sleep quality, which in turn is associated with higher levels of well-being and focus/concentration. There is yet another way in which physical exercise can help our trading. By training ourselves to tackle challenges, day after day, we build a mindset that encourages the tackling of challenges in other areas of life. Quite simply, developing ourselves physically can be a powerful pathway toward developing our performance--in markets and in our personal lives. In the most recent Forbes article, I highlighted the importance of monitoring the amount of movement we get per unit of market volume. When we look at normal bar charts, we see price as a function of time, with volume on the X-axis. A large bar tends to be one in which we see increased volume (increased participation at that point in time), moving the market more than usual. A different way of viewing market behavior is to look at volume bars (price where each bar represents an amount of volume traded) and see if bar size (volatility) is expanding on the upside or downside. What this is telling us is not just how much volume is coming into the market, but how much each unit of volume is actually moving price. When we see bigger bars coming in on market upmoves than downmoves, we can actually visualize where the market is finding its greatest ease of movement. Above we see the full day's trade in the ES futures for 10/16/2018. It's a great day to study, given the major turnaround in the overnight session and trend day during NY hours. 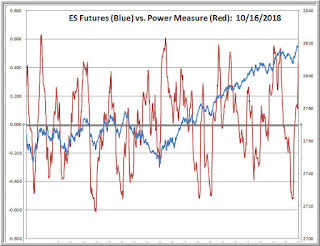 The blue line is the ES futures, with each bar representing a small unit of trading volume. The red line is a running correlation of the size of the bars and the directional movement (open to close) of the bars. Hence, when we get more upside movement per unit of trading volume, the correlation goes positive and vice versa. 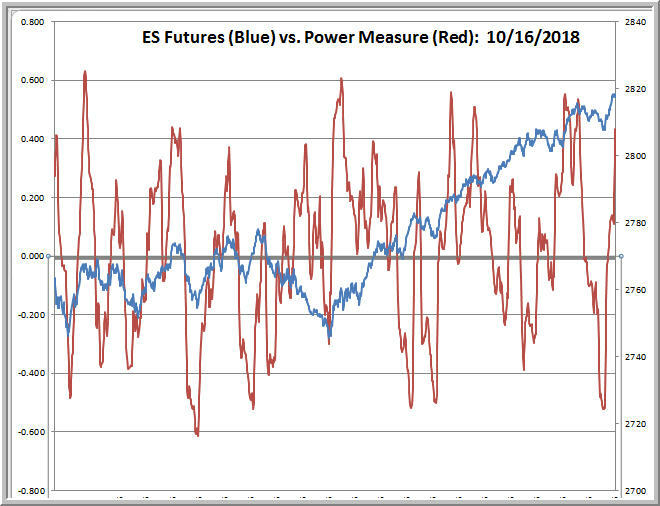 Shifts in this "power measure" tell us that volume is moving price more easily in one direction than another--a worthwhile heads up, though not a precise timing measure. Notice, for example, how the correlation shifted positive and stayed positive during the period of the market's big turnaround. Notice how subsequent moves lower in the correlation occurred at successively higher price lows--a great indication of the underlying strength of the market. This is a relationship relevant to multiple time frames. The illustration above, with over 500 bars per day, is clearly relevant to active day traders. I maintain the measure for bars with much larger volume to examine multiday patterns. The value of such measures is not as crystal balls, but as multiple lenses through which we can understand the dynamics between buyers and sellers. There are many other such lenses, such as the shifts in distribution of upticks and downticks across all listed stocks. Many trading problems occur, not because of emotional disruption, but because of cognitive poverty: an absence of perspectives that yield fresh, valid insights. If Noah had waited for the storms and floods, it would have been too late to gather the animals and build the ark. Our role as traders is to prepare for possible adverse outcomes so that we can ensure our survival should one of those materialize. How can we prepare properly? In the recent Forbes article on how to navigate these volatile markets, I make the point that a close examination of similar historical periods can help us anticipate a variety of scenarios: both ones of risk and ones of opportunity. It's not that the immediate future will replicate any of the past price paths in similar circumstances. It's that the past price paths can tell us what is possible--and maybe even what is likely--going forward. So let's take a specific example. I recently noted that we had made a multi-standard deviation move to the downside--over five standard deviations, to be precise. In similar situations going back to 1993, we were up 11 times, down 4 over the next five trading sessions. Of the four down instances, all were lower by more than 2%. Of the eleven up instances, six were higher by more than 3%. Volatility was the norm and bounces were common. Psychologically that alerted me that, even though I thought we could see further downside, I had to be prepared for short squeezes. In fact, those have been more common in the past than not. The past instances also alerted me to the likelihood of further volatility, which led me to temper my position size. When we traded weak in morning hours, I took an initial short position, saw it go my way modestly, and then bounce higher. The quality of the bounce made me take notice, as it demonstrated a shift in the amount of movement per unit of volume--something I describe in the Forbes post. I quickly covered my short position for a small loss and avoided a larger drawdown. Knowledge of the past prepared me for possible future outcomes. It helped me stay open minded--and that helped me manage risk. In trading as in sports, preparation primes us for action and that builds our mindset. And the trick, of course, is getting cut the right way. 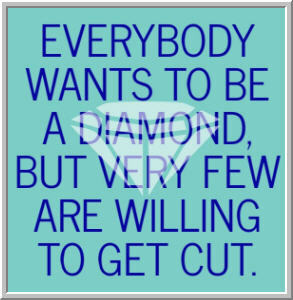 An uncut diamond isn't worth much, and a diamond cut the wrong way is too flawed to be worth anything. When we take losses the right way and learn from those, that's when we develop the facets that give us value as traders. One of the bad cuts I see people taking in the recent equity markets is failing to adapt to new, volatile market conditions. Buy the dip at VIX of 12 is quite different from the same strategy at VIX of 24. When a market becomes more volatile, we trade more volume per unit of time. Moves that might have unfolded in hours now occur in a few minutes. That has relevance for how you size positions and how much heat you can take on ideas that ultimately work out. I looked at the overbought/oversold statistics from Index Indicators and found something outstanding. Fewer than 5% of stocks in the SPX are trading above their 3, 5, 10, and 20-day moving averages. In other words, not only are we quite oversold; we are very broadly oversold. Essentially everything has gone down. So what has happened historically after such broadly oversold occasions? 1) These rare occasions can "clump". When we see one, it's not unusual for others to follow. This is also something we saw in the last post. A very oversold market can stay oversold for a period and indeed become more weak. 2) These occasions have occurred during markets we have recognized as meaningful corrective periods or as bear markets. These occasions have also been accompanied by significant volatility. The median VIX for the 15 occurrences has been almost 41. The median VIX for the rest of the sample is a little over 16. And what have been the forward paths for these broadly oversold markets? * Bounces have been the norm, but it's not always a one-way path. The next day has been 9 up, 6 down. Two days later has been 12 up, 3 down. Five days later has been 12 up, 3 down. That being said, ten trading days later we see 8 up, 7 down. Ten of the 15 occasions have posted a lower daily close within a ten trading day period. Two-sided markets over the next two weeks are not unusual. * Forward volatility is expectable. Thirteen of the 15 occasions moved more than 2% from close to close over the next two trading sessions. Nine of the occasions moved more than 4% up or down over a next five-day period. Very large moves are not uncommon. During 2008, we saw near-term closes up 9% or more and down 9% or more. After the 2011 occurrences, we saw moves up and down exceeding 5%. * There has been opportunity longer-term. The longer-term investor recognizes that broadly oversold markets are taking down high quality, growth companies along with less stellar firms. This can create unusual value for individual stocks and also for the market. With the exception of the 2008 occurrences--a protracted bear market--we were meaningfully higher in SPX one year after the broad selling periods. If we believe this to not be a recessionary period with major economic dislocations, the drop can be a great opportunity to buy stocks for longer-term holding periods. So it's back to the theme of getting cut the right ways. When market participants puke, it's common to see favorable forward returns, but not without volatility and retracements. Shorter-term traders can take each day as it comes, knowing there will be meaningful movement to capture. Longer-term investors can identify stocks worth snapping up at bargains, but also create market hedges (and size appropriately) to weather the forward volatility. Knowing historical patterns is a great way to prepare oneself for forward price paths. What Happens After a Big Down Day? 1) This daily move down was more than 5 standard deviations from the average move, using the last 100 trading days as a reference point. 2) Downward moves of over 4 standard deviations have occurred only 15 times since 1993. So, in over 6000 days of data, this has occurred less than .25% of the time. It's a truly rare occurrence. 4) One day, five days, and 20 days later, the market was up 11 times and down 4. Over the course of the next 20 days, the market made a lower close on 9 of the 15 occasions. On the occasions where the market made lower closes five days later, all four declines were in excess of 2%. On 10 of the 15 occasions, the market moved more than 2% over the next 10 trading days. Volatility continued to be the norm. A) We are in a historically rare event. Casually applying normal rules and "setups" to the current situation can be hazardous to your wealth. B) A bounce from the big down day is the most common scenario. Twelve of the 15 occurrences posted a higher close within the next five trading days. That being said, the majority of instances also posted lower closes over a 20 day horizon. V bottoms have been the exception. C) Volatility continues over the next 20-day period, with moves greater than 2%--up or down--occurring in all but two of the instances over the next ten trading days. D) The presence of one rare drop does not preclude others from occurring and indeed there is evidence of clustering during bear periods. Failure to sustain rallies after the big drop should be viewed with caution. Significant additional large drops occurred in 2008, 2015, and 2018, for example. Psychologically my takeaway is that investors should have a long-term view of opportunity--on a long time frame these were good buying opportunities--but on a short time frame a degree of hedging is prudent. Shorter-term traders should view a failure to sustain bounces as possible occasions for further large declines. Open-mindedness is key. Above is a screenshot from my trading station, capturing roughly the last eight days of trading in the ES futures, using hourly data. Volume is on the X axis. Below volume is a two-period RSI that is a very short term measure of overbought/oversold. Above volume is a linear regression line (red) with bands of one standard deviation (blue) above and below. The chart nice illustrates how markets are a joint function of linear trend (the regression line), with one or more cyclical functions overlaid (the movements from upper to lower bands; the movements between short-term overbought and oversold). Notice how often the market will take out a prior low or a previous high, only to cycle back the other way. It's a good illustration of how traders who think primarily in terms of breakouts, momentum, and directional trends get "chopped up" by the market's cyclicality. Much of the frustration from trading comes from the imposition of linear thinking on markets that have significant cyclical drivers. During stable market periods, we can "solve" for dominant cycles and then use movement above and below the bands to identify when stability is breaking down and we're entering a different cyclical or directional regime. The idea is *not* to trade according to your personality. The idea is to capture the linear and cyclical components of markets and trade the market's personality. So what does have edge? In my experience, it comes from identifying when 1) the herd (which thinks one-dimensionally in terms of linear/directional movement) gets trapped at cycle extremes and 2) when shorter-term "mean reversion" traders get trapped by the momentum components of longer-term cycles and trends. What has edge in the quant world is the dynamic modeling and re-modeling of shifting cyclical and directional components of markets, rather than static, curve-fit models based on lookback periods. This is a big reason why funds that make use of true machine learning are the top performers in recent years and why many funds underperform their benchmarks. In a recent article, I ask the question of whether individual traders can succeed in financial markets and take a look at actual research on the percentage of traders who sustain profitability. I also examine a number of successful training efforts and what they are doing to increase the odds of trading success. The real way to learn trading is not so different from the real way to learn to be a doctor: see one, do one, teach one. Medical students begin their clinical education by shadowing experienced doctors and seeing first hand what they do, hearing why they're doing it, and observing how they do it. Learning first occurs at the bedside or in the examination room. The next phase of learning for the medical student is doing some of the work with patients themselves, while under close observation and supervision. This might begin with taking histories and conducting physical exams and progress to assisting in simple procedures, such as removing a skin growth. All of this learning occurs within a team, with frequent evaluation and feedback to build skills. The more advanced phase of learning occurs when the medical student becomes a resident physician and participates in the teaching of new students. 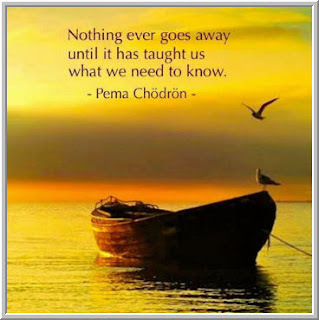 We learn by observing and doing, but it is teaching others that cements our knowledge and extends our experience. As this analogy points out, the real way to learn trading is to not learn solo. Basketball and football players always learn from coaches and teammates; artists, musicians, and chess masters always train with mentors. So few succeed in financial markets because: a) they begin with limited capital and cannot sustain a living from normal, expectable returns; and b) they lack structured learning processes and resources. The old model of trader education emphasized didactic seminars/webinars; the newer model embraces mentoring and interactive learning in teams at hedge funds and proprietary trading firms and via online communities. It is in these venues that traders have a real opportunity to see one, do one, teach one. And it is in these venues that we can see enhanced odds of trading success.